For users 160 lbs or less, consume 1 scoop mixed in 8 oz of water 30 minutes prior to training. For users over 160 lbs, consume 1–2 scoops mixed in 8–12 oz of water 30 minutes prior to training. Do not exceed 2 scoops per serving. This product is only intended for healthy adults 18 years of age or older. Do not use if you are taking erectile dysfunction medication. Do not take additional nitrates in the form of medication or dietary supplements along with this product. Before using this product consult with your physician, especially if you are using any prescription or over the counter medication or if you have or suspect you have any pre-existing medical condition including but not limited to: high or low blood pressure, cardiac arrhythmia, stroke, heart, liver, kidney or thyroid disease, seizure disorder, psychiatric disease, diabetes, difficulty urinating due to prostate enlargement or if you are taking a MAOI ( Monoamine Oxidase Inhibitor) or any other medication. Discontinue use and consult your health care professional if you experience any adverse reaction to this product. Do not use if pregnant or nursing. Discontinue use 2 weeks prior to surgery. Do not use if safety seal is broken or missing. Shake tub before each use. Store in a cool, dry place. KEEP OUT OF REACH OF CHILDREN. Citric Acid, Natural & Artificial Flavors, Silicon Dioxide, Sucralose, Acesulfame Potassium, Beet Juice Concentrate. The pump and performance supplement to end them all! 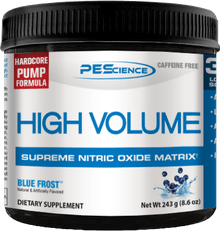 High Volume is an absolutely loaded stimulant-free pre workout supplement made for incredible nitric oxide pumps, true muscle growth, and serious gains in the gym! Big News! High Volume is out from PEScience! 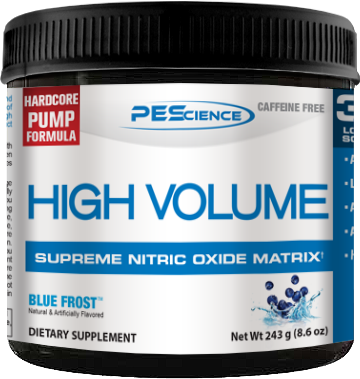 PES purchased the rights to High Volume from Athletix, and has reformulated the product so that it's stronger than ever! They're going to prove it soon enough with free samples! On this page, you can sign up for price drops. We'll also shoot you a message when PESHighVolume.com is ready to go with free samples to try before you buy! Note: The ingredients are likely to be reformulated, but here's where you can get an idea of what is to come... the Athletix formula was strong as it was, so we're really excited to see what PES is up to here! We took a long hard look at the supplement industry. We noticed a lot of workout supplements are heavy on the stim and low on the pump. So we created High Volume. A Non- stimulant pump preworkout that does what it says. Gives you all the pump and endurance without a stimulant complex. This allows you to pair it with your favorite stimulant or train without stimulants all together. The pumps on High Volume are incredible featuring 3 proven pump ingredients paired with additional performance ingredients. Try High Volume Pump Supplement Once and You won't ever go back! As a dietary supplement, take 1-2 scoops mixed with 8-10 ounces of cold water, 30 minutes prior to your workout. Do not exceed2 scoops in a 24-hour period.